Molly, 12 months, was unable to see since birth because she suffered from a entropion, a congenital disease which causes folds of skin to rub against the eye. Her owner Louise Walsh, from Romford in Essex, said: 'When I first got her all she did was sleep because she was in so much pain. 'Now she is so happy all the time - playing, exploring and she loves chasing crows. Molly's life was turned around by vet Richard Marks, from the Goddard Veterinary Group in Gidea Park, Essex, who carried out vital surgery to let her see again. He said: 'What I essentially did was give her an extreme facelift. I removed a large piece of skin and stitched the remaining skin to the back of her head. The vet blasted the over-breeding which led to Molly suffering from one of the worst cases of the entropion he had ever seen. Mr Marks said: 'Molly is a result of very bad breeding between dogs that are essentially diseased. Ms Walsh bought Molly for £500 just last month, but has already shelled out £720 in vet bills. She now plans to sue the owners, from Wales, who sold her the pet, claiming they were not honest about her state of health. She said: 'I'm very angry. It's not about the money, it's the fact they were dishonest. A row erupted two years ago about the over-breeding of pedigree dogs following a BBC documentary that exposed health problems among some of the most extreme cases. 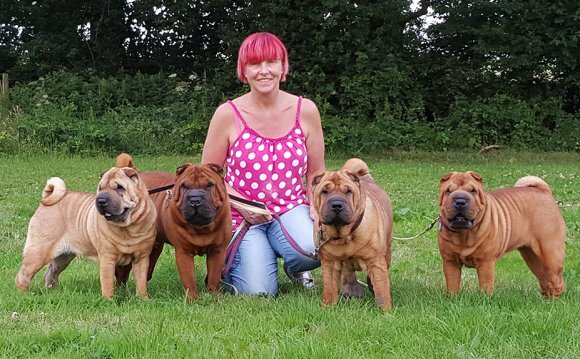 The Shar Pei was among 12 breeds documentary makers demanded be dropped from Crufts as a condition for continuing to air the celebrated dog show. The demands were not met by the Kennel Club. Shar Peis, also known as the Chinese wrinkle dog, and can be traced back to the Guangdong province of China. Shar-Pei Alfie & Labrador Frankie.